The fossil record of giant flightless birds extends back to the Late Cretaceous, more than 70 million years ago, but our understanding of these extinct birds is still incomplete. This is partly because the number of specimens available is sometimes limited, but also because widely different approaches have been used to study them, with sometimes contradictory results. 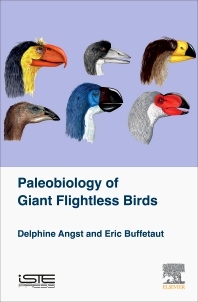 This book summarizes the current knowledge of the paleobiology of seven groups of giant flightless birds: Dinornithiformes, Aepyornithiformes, Dromornithidae, Phorusrhacidae, Brontornithidae, Gastornithidae and Gargantuavis. The first chapter presents the global diversity of these birds and reviews the tools and methods used to study their paleobiology. Chapters 2 to 8 are each dedicated to one of the seven groups of extinct birds. Finally, a conclusion offers a global synthesis of the information presented in the book in an attempt to define a common evolutionary model. Delphine Angst is a postdoctoral researcher at the University of Cape Town in South Africa. Her work currently focuses on the study of paleobiology and paleoecology of giant flightless birds through a multidisciplinary approach. Eric Buffetaut is Director of Research Emeritus at the National Center of Scientific Research (Geology Department of the Ecole Normale Supérieure, Paris). After working on crocodiles, dinosaurs and pterosaurs, he is now mainly interested in the paleobiology of extinct birds.